See also: Chowan County Courthouse; Cupola House. Edenton, incorporated in 1722 and located at the head of Albemarle Sound in Chowan County, was the first colonial capital of North Carolina as well as a significant commercial center. The town was the home of James Iredell, who began his distinguished career as deputy collector for the Port of Roanoke. He became attorney general of North Carolina at the age of 28, worked for ratification of the new constitution in the state, and in 1790 was appointed by George Washington to the first U.S. Supreme Court. He was an exponent of judicial review, and with his friend, Justice James Wilson, laid the foundation for the Eleventh Amendment to the Constitution. The Daughters of the American Revolution purchased the Iredell House in 1948 and saved it from demolition; in 1951 the North Carolina General Assembly authorized the Department of Conservation and Development to assume title to the property by paying off the debt. Four years later the homesite was transferred to the Department of Archives and History and deemed a North Carolina State Historic Site. 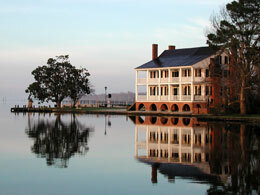 The modern-day Historic Edenton State Historic Site features the James Iredell Homesite and the 1767 Chowan County Courthouse. Three additional historic properties, although not held by the state, are open during conducted tours: St. Paul's Episcopal Church (1736), the Cupola House (1758), and the Barker House (1782). Thomas R. Butchko, Edenton: An Architectural Portrait (1992). Don Higginbotham, ed., Papers of James Iredell (2 vols., 1976). Barker House, ca 1782. Photo courtesy of NC HIstoric Sites. Available from http://www.nchistoricsites.org/iredell/ (accessed May 8, 2012). 1 January 2006 | Strong, William B.
I would like for it to be a little bit longer.